Serneke signed an agreement with Framtiden Byggutveckling AB today on the construction of 125 apartments, offices and an elderly home around the square Selma Lagerlöfs Torg in Gothenburg, Sweden. The order is valued at approximately SEK 315 million. The agreement also includes an option for another phase of 101 apartments worth approximately SEK 168 million. The agreement is a part of the Selma Stad project, involving a renewal of the entire area around Selma Lagerlöfs Torg, which was originally built in 1971 and is a local shopping and transport center in the northern part of the Hisings Backa area. Plans include around 1,000 homes, offices, retailing and service, a sports center and a new city district municipal building with room for cultural activities together with a new square section and park section. Serneke’s part in the project comprises 125 apartments, offices and an elderly home spread over three blocks and approximately 17,600 square meters of GFA. All of the apartments will be managed by Familjebostäder. The agreement is divided into phases and a contract is initially being signed for phase 1 and 2, which amounts to a value of approximately SEK 315 million. Phase 3 is an option worth approximately SEK 168 million. “We are very pleased to be working together with Framtiden Byggutveckling to contribute to the development of Selma Stad. We have already had several successful public sector projects together in Gothenburg, and we are looking forward to continuing on the same track,” says Daniel Åstenius, CEO at Serneke Construction. “We are finally beginning construction in Selma Stad! We are looking forward to contributing to the transformation under way at the square and along the street Litteraturgatan together with Serneke. 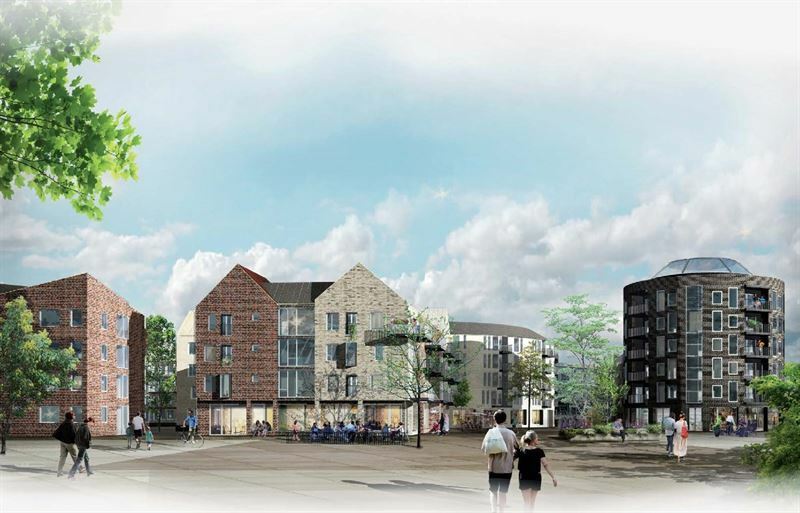 Here, we will add rental apartments, business offices and an elderly home, which are located close to both square and park areas running through Selma Stad,” says Marie Dellve, Project Manager at Framtiden Byggutveckling. Start of construction is scheduled for the end of 2019 or early 2020. Completion of phase 1 and 2 is expected to take place in 2021 and 2022 and a possible phase 3 in 2023. The order value of SEK 315 million is included in the order book for the first quarter of 2019. Serneke is a rapidly growing corporate group active in construction, civil engineering, project development and property management. The Group was founded in 2002 and today has income of nearly SEK 6.5 billion and nearly 1,200 employees. Through novel thinking, the Company drives development and creates more effective and more innovative solutions for responsible construction. The Company builds and develops housing, commercial buildings, industrial facilities, public buildings, roads and civil engineering projects, and other infrastructure. The Company’s customers are public and commercial clients, and operations are focused on the three metropolitan regions in Sweden, Gothenburg (Region West), Stockholm (Region East) and Malmö (Region South). Serneke has its headquarters in Gothenburg and offices in Stockholm, Malmö, Alingsås, Borås, Eskilstuna, Halmstad, Helsingborg, Skövde, Strömstad, Trollhättan, Uppsala, Varberg and Växjö. The Company’s Series B shares (SRNKE) have been listed on the Nasdaq Stockholm exchange since November 2016.